This afternoon I went outdoors in the beautiful 60 degree weather and harvested our potato crop. Truth be told its a rather small harvest of potatoes but considering that I didn’t intentionally plant them I am quite pleased! When you leave behind a few potatoes from the spring/early summer harvest they grow into a nice fall crop. Growing potatoes is extremely easy to do and can be done in containers or the ground. 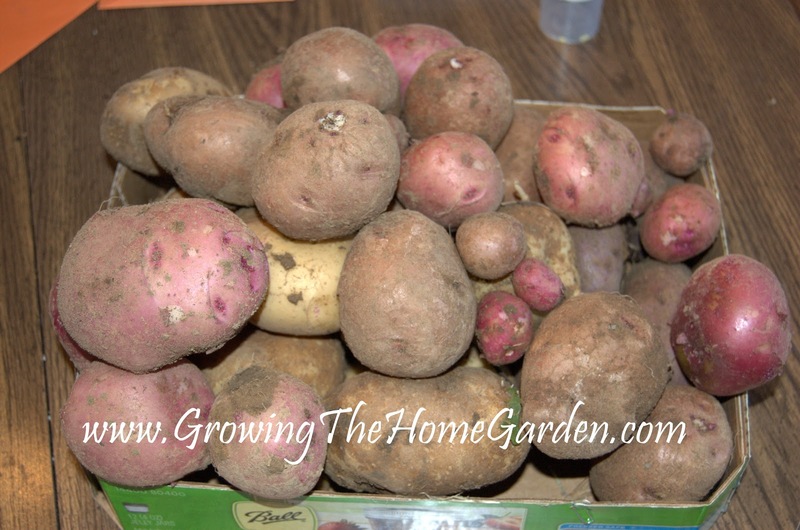 Our harvest consists of my favorite potato, the ‘Yukon Gold’, as well as Adirondack Blue and some red potatoes. They all taste great but the Yukon Gold has a very buttery flavor when cooked that just makes my mouth water when thinking about it! We’ll use the small taters as fried potatoes in some grape seed oil while the larger ones we’ll save and use for baked potatoes or potato soup this winter. In Atlanta, would I be better off planting potatoes now or waiting until spring? I've been itching to try them. At this point you should wait until spring. We usually plant around March here but you may be able to do it earlier.